This has to be one of my favorite combinations at the minute, Essie's After School Boy Blazer & Butter London's The Black Knight, they're almost a match made in heaven, the dark, almost black, navy of After School Boy Blazer (I'm starting to get fed up of writing that so we'll call it ASBB from here on!) and the mini multicoloured sparkles in the Black Knight match perfectly. The Black knight has black, silver, blue and pink glitter in it in a gelly like black base colour and adds a little bit of glitz to ASBB. I've actually been wearing ASBB pretty much solidly ever since I bought it so it's quite nice to be able to throw the Black Knight on top and make it a little different. It's also quite a good day to night combination, with just ASBB during the day for work and being able to throw The Black Knight over the top for after work drinks or party. One of the best bits about this combo is that you only need one coat of each for a perfect finish. What do you think of this combo? Any others I should be trying with these polishes? 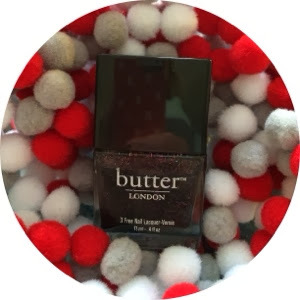 6 comments on "NOTD // Essie After School Boy Blazer & Butter London The Black Knight"
I really want to try Butter London polishes!